Picture this: You’re applying your toner and moisturizer, getting ready for bed, when out of the corner of your eye, you spot it. A dark, scraggly lone strand of hair on your chin. Female facial hair. So many of us struggle with it (no matter how minimal) yet so many of us are ashamed by it (with the exception of awesome women like Harnaam Kaur) that we shell out loads of money to get rid of it permanently. But why does it happen, specifically for women and especially after menopause? Hormones. Some women experience extra hair growth during puberty, pregnancy and as they age. It’s during these stages in our lives where we undergo shifts in hormonal balance. While females all have a small level of testosterone in our bodies, our production levels of estrogen levels decrease as we age, leading to steady testosterone levels that can trigger the development of more masculine features. Though an onset of a rapidly growing facial hair in excess should warrant a visit to the doctor, most cases are a result of hormonal shifts and genetics. 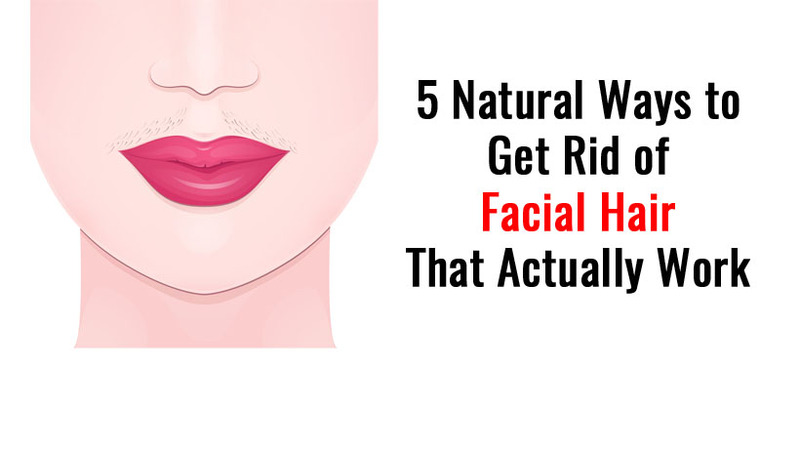 Choosing what to do with facial hair is all a matter of preference, but if you wish to remove it naturally without spending the big bucks, here are some natural, alternative methods. You guessed it. While many may believe that shaving hair on the face or body will make the hair grow back thicker, it turns out this is but a common myth. However, always be sure to replace your blade regularly (you’re likely to nick yourself with a dull razor), lather up with soap or shaving cream and shave in the direction your hair grows to prevent irritation and ingrown hairs. Sugaring is an ancient Middle-eastern practice that works as a healthier alternative to waxing. Made simply of sugar, lemon and hot water, it is by far the most gentle method of hair removal yet lasts longer than traditional waxing. Experts recommend that sugaring is suitable for all areas of the face with the exception of the eyebrows, as that area is highly sensitive. According to brow expert Hippa Kabil, its effectiveness is due to the fact that the mixture sticks solely to the hair and not the skin. Kapil also recommends sugaring only on hair that’s at least a quarter of an inch long (for the gel to easily bind to the hair at the root) and that the target area is well-exfoliated, and not oily. Did you know the ingredients for some of the most efficient methods of hair removal are lying around right in your kitchen? The yellow spice may seem strange to use on your face but has long been used in India to remove unwanted hair and inhibit hair growth with regular and consistent use. While it may be effective for removing fine hair, it may not remove dense or thicker hair. Create your own turmeric mask using turmeric powder and baking soda or turmeric powder using the recipes at the end of the article below. Who would’ve thought the pumice stone could do more than scrub off dead skin from your feet? Though the results may only last for a few days (much like shaving), it is still a 100 percent natural way of removing hair. On clean dry skin, use a dry pumice stone and gently apply pressure to the hairline of the area of hair you’d like to remove in small circular motions. The pores and the rough texture of the pumice stone will cling onto hairs and pull them out. Be sure to rinse your face afterward and moisturize well as the stone may leave your skin dry due to its exfoliating effect. Though this practice may seem relatively new-age here in the Western world, its origins date back centuries in the Middle East and South Asia. In India, threading was traditionally used to remove hair from parts of the face (not just from the eyebrows as you may be accustomed to seeing), such as the upper lip, chin, sideburns and cheeks. While the concept of threading may seem simple, it takes a skilled technician to do the job properly. First, they take a loop of cotton thread (about the same thickness as that of dental floss) and twist the loop to create a series of knots in the middle. By moving the twisted area rapidly, back and forth across the row of hairs, the thread grasps the hair at the root to remove completely. Though threading involves little contact with the skin, it can still be painful and you may experience some itching, redness or irritation for a short while after the procedure. Be sure to do your research on experienced practitioners who can provide this service in a safe and clean environment.